First is another Melche Shutilforc beauty. 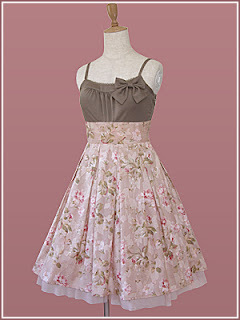 It comes in two colourways, this gorgeous brown X pink, and a cream top X light blue floral skirt. This was only released today I think! It also has a detachable halter neck with frills. Cute! I also really like the underskirt peeking out. Which colour would be best on a paleface like me? And this lovely Victorian Maiden summer dress. It comes in three colourways: this one (cream and purple flowers), cream and yellow flowers, and black and white gingham. I think I'd go for the cream and yellow colour. This is still on reserve, due to come out in May. I'm not usually a fan of fully shirred items, but this is done very well. It's nice and understated. I like the ruffled neckline. It looks so cool! Able to be worn without a blouse for maximum air flow! One thing these dresses have in common is that they're quite casual. I could wear these to the shops, or to a cocktail party, depending on my shoes and how I wear my hair. I like clothes like that! To be able to wear them in America for what I'm doing, it's important to be able to breathe and move easily. A lot of dresses I've bought (thankfully not the expensive ones!) are really pretty but constrict my giant rib cage* and so never get worn. It's kind of a shame! I would like to fix them but don't want to fail and ruin a lovely dress. The Melche Shutilforc dress looks a little constricting but the VM one looks amazingly comfy. I added these two dresses to my Wishlist, because in all honesty, I wish I had them.